Todays offering is a local North Carolina brewery, Bombshell brewery from Holly Springs, NC. Apparently, this is the first 100% Women owned brewery! Hooray for equal opportunities in the beer brewing businesses! We actually visited this brewery while running from Hurricane Florence last year and it is definitely a place we would recommend to anyone that asks. Cool atmosphere, great beer and friendly people. 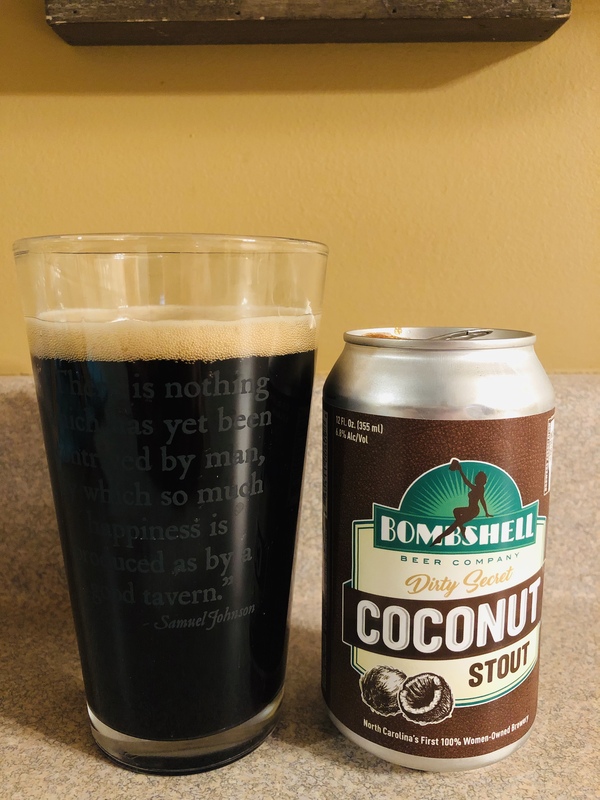 Now for their Coconut Stout, the smell is more coffee than anything else, the color is a rich dark roast and the taste is very smooth but…not much Coconut flavor. At least not for a Coconut lover like me. However, I still really like this beer, like a lot(the 6.8 alcohol content doesn’t hurt either).And that’s saying something coming from someone that doesn’t drink coffee and is not a fan of most “stout” beers. So very well done ladies! I look forward to more of your concoctions, 3.5 stars. Enjoy!